iDancehallReggae.com::Caribbean Lifestyle Media::: Richie Spice To Be Sued by Connecticut Promoters? Richie Spice To Be Sued by Connecticut Promoters? Caribbean Lifestyle Media: We learned recently that Richie Spice is being sued by a Connecticut based promotion company called Cliff Side Entertainment. In a recent press release (Thanks Nikki Z), Cliff Side Entertainment stated that they "paid 50 percent deposit plus air fare and hotel accommodations for Richie Spice and three of his entourage to perform at a concert in Connecticut on July 2, 2011." Connecticut is one of the major stops for any Reggae/Dancehall acts touring the Northeast. The who's who of the Dancehall/Reggae has graced the stage at the West Indian club where this event was held. In the press release Cliff Side Entertainment alleged: Richie Spice was scheduled to arrive in the USA on June 30th 2011 however; he changed the ticket date and arrived one week earlier. After finding that the ticket had been changed, the management team at Cliff Side Entertainment was told that Richie Spice wanted to arrive a week early because of a Promotion they were doing with VP Record, to promote his new album and they did not want to miss the opportunity. The management for Richie Spice stated that they would just do an album release which they scheduled for June 27th 2011 at SOBs in New York to which VP Records compensated. However, Cliff Side Entertainment Management later found out that Richie Spice took other concerts for which he was paid a performance fee before performing for the show which he was booked for initially. 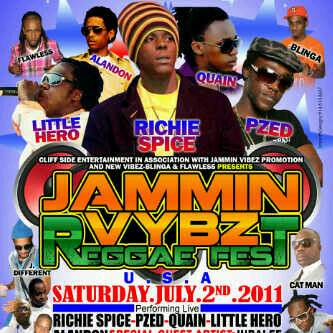 Furthermore, Richie Spice was schedule to arrive for promoting the show on June 30, 2011 but instead he showed up on July 2, 2011 and instead of hit the ground running with all the activities that was planned for that day by Cliff Side Entertainment management, he checked himself in the hotel which was reserved for him by Cliff Side Entertainment and went to sleep, his mangers exact words “If Richie don’t get some sleep I Sheron Rose would not like the outcome”. Cliff Side Entertainment Management, Sheron Rose later confronted Richie’s manger about doing other show at the company’s expense and requested a refund for the airline tickets and offer only to pay the difference of the air line tickets plus the per diem to cover the balance of his 50 percent. They refused, stayed in hotel and Richie Spiced never performed for his fans. Cliff Side Entertainment stated that violence broke out at the event and they would like to apologize to the patrons and then went on to say "Cliff Side Entertainment will submit to the court a full outline and more in dept detail of what transpired up to July 2, 2011 with Richie Spice Management team and will pursue a law suit to recover all expenses loss not limited to pain and suffering caused. The team at Cliff Side Entertainment is also asking for his visa to be revoked and to be banned from doing any more shows in the USA." Here is what we do know: 1. Richie Spice was in Hartford on July 2nd as confirmed by RisingStarsTV. 2. Very few persons were at the venue. 3. Reports were that there were fights in the venue, however, we have not been able to confirm that any fights took place at the West Indian Social Club. We are not sure how much leverage this promotional team has to request revocation of Richie Spice's visa. It will be interesting to see how far this goes. Who played who? You decide! At this time Richie Spice management was contacted for a statement and we will keep you updated if we get a response. Update 7/7/11: Read Richie Spice Management Response.